North Manchester's first public library was begun in 1908 by the North Manchester Woman's Club. Town history places the neophyte library in the home of Mary Peugh (Mrs. Tobias) on Elm St. Books collected from Woman’s Club members and other local residents were loaned out to library members. As demand for library services grew, another site was sought for the library. The Woman’s Club sponsored a book shower, and the first public library opened in 1908 above the current town offices in a room of the Town Hall with over 400 books: 125 from book donations and the rest from traveling library collections loaned by the Public Library Commission. Club members took turns serving as librarian during library hours two afternoons and evenings a week. Public financial support of the library was the next step. The Woman’s Club approached the Town Council for a tax levy of $0.05 per $100 assessed valuation of town property which would bring $600 to the library in the upcoming year. The levy was approved. In 1909, an increase of the tax levy to $0.10 also was approved, bringing $1,400 to the library. 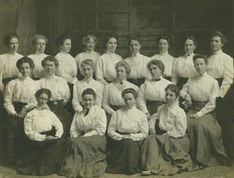 That same year the first library board, comprised of Woman’s Club members, was established. Board members were Leila Gingerick (president), Laura Ginther, Ida Martin, Rose Noftzger, Mary Peugh (vice president), Della Sheller, and Natalie Wolfe (secretary). For many decades it was a custom for a member of the Woman’s Club to be on the library board. ​In late 1909, after learning that Andrew Carnegie was donating funds to build libraries, the Woman’s Club contacted the steel magnate with a request to be considered for funding. He replied in early 1910 with the promise of a $10,000 gift for the erection of a building provided that the town purchase a site and secure $1,000 of funding each year for the management of the library. The tax levy at the time was enough to cover the amount required to manage the library, so the Woman’s Club focused on raising the funds needed to purchase a building site. Fund raisers included a lyceum course the club organized at the Old Opera House which was housed on the second floor of a Main Street building located at the site of the present day farmer’s market. The course included programs with such luminaries as James Whitcomb Riley who was reputed to read poetry in the evenings to audiences for pay after spending his days painting barns. W.E. Billings, local newspaper publisher, and Isaac Oppenheim, department store operator, were among the local business owners, many of them husbands of the club members, who assisted in soliciting funds for the building site. Isaac Oppenheim, W.E. Billings, and W. Barnhart were appointed to help the library select a suitable site. Private citizens raised $1,500 to purchase the Harter lot on Main Street. Soon after, a building committee of Isaac Oppenheim, Thomas A. Peabody, and A.C. Wolfe was appointed to help with the building project. Designs for the 4,500 square foot building were accepted. Ezra Frantz of Frantz Lumber Co., and the great grandfather of Joe Frantz, won the contract to build the library. He and the Woman’s Club treasurer, Laura Ginther, signed the contract in 1911. Construction began with a cornerstone laid in July of 1911. The cornerstone included pictures of the Woman’s Club, a history of the library association, a list of library directors, several copies of The Journal and The News, a roster of business firms in the town, and a number of photographs of the business district in North Manchester. On April 4, 1912, North Manchester Public Library's 2,300 sq. ft. Carnegie building opened with 1,700 books. The Carnegie building, significant in that it is one of the few libraries built by Andrew Carnegie that featured an auditorium, served as the library through September 1995, basically unchanged. In 1930, the children's department was opened on the second floor, which had been previously used as the auditorium. Services to Chester Township began in 1919. Four years later, the library purchased a used Ford roadster truck which performed as a bookmobile for rural Chester Township. In 1995-96, the library board placed a protective easement on the building through the Historic Landmarks Foundation of Indiana, and the building was sold to Al Schlitt and Elden Stoops for their law office. The Carnegie building also has been placed on the National Historic Register. As the library's services and collections outgrew the Carnegie building, the library board considered other options. In 1979, the Central School on Fourth and Market Streets was demolished and, in 1980, the library board purchased the property from the school corporation in anticipation of building a new library facility. Concerns for the future of the Carnegie building, and funding for a new library, inhibited the progress toward construction of a new building. In 1992, the Fort Wayne architectural firm Able Ringham Moake Park was hired to design a new building. A fundraising committee began the work of funding the project without raising taxes. Two years later, the Mary K. Peabody Foundation learned of the need for funding. Mary K. Peabody was a life-long resident of North Manchester and the daughter of Thomas A. Peabody who served on the Carnegie building project. The Foundation's grant committee supported the construction of the library because of their awareness of the important role the library played in Mary K. Peabody’s life as a child. She also was known to remark that the former Central School lot would be perfect for a new library. The Foundation agreed to construct a 20,000-sq. ft. building with the provision that raise a $1 million endowment for the library operations. Money contributed during the fundraising campaign was diverted to a Library Operating Endowment (eventually, $1.5 million was raised), which continues to grow and support the daily operations of the library. In recognition of their generous contributions to the Library Endowment, the community room is named for Glen and Eleanor Blocher. Ground was broken for the library in July, 1994. Fourteen months later, the contents of the library were moved to the new location. The new North Manchester Public Library opened on Monday, October 9th, 1995. In 1996, the Indiana Library Foundation granted the “Partnership Award” to the Mary K Peabody Foundation and the North Manchester Public Library. The awards celebration was held at the annual meeting of the Indiana State Library Association at their annual meeting in Indianapolis.